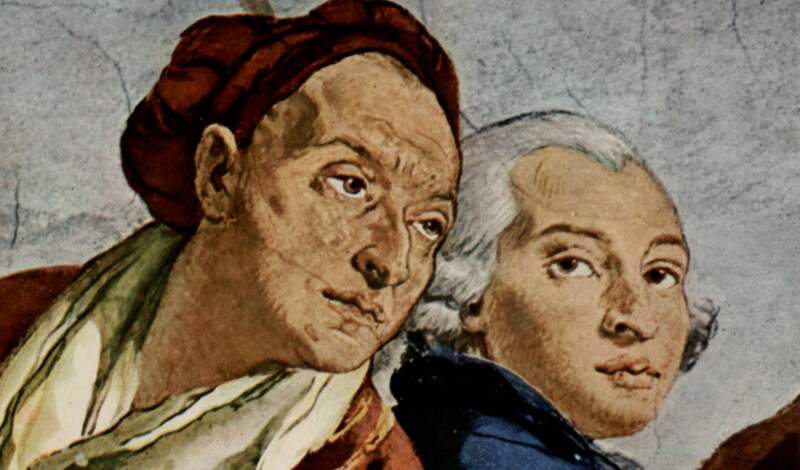 Giovanni Domenico Tiepolo is an artist with two distinct parts to his career. The first part is conventional, predictable and public. The second part is enigmatic, comical and mostly private. So distinct are these two phases, and so different are the artworks that come out of them, that it’s best to consider them one at a time. When he shows up in my novel, The Merchants of Light, the character Domenico is coming to the end of part one. He seems secure, confident, maybe even a little smug. From a young age, he’s enjoyed a successful painting career, first as partner to his famous father, Giambattista Tiepolo, later as a prominent Venetian artist in his own right. So far, so historical. The real Domenico was, like my fictional one, born into his first career. As the eldest surviving son of Giambattista Tiepolo and Cecilia Guardi Tiepolo, he was expected to follow his father into the family business and that’s just what he did. He learned his craft in Tiepolo’s studio, mastering his father’s distinctive style and eventually becoming his indispensible right hand man. After Tiepolo’s death in 1770, Domenico inherited the studio and carried on as before, serving as President of the Venetian Academy, and generally maintaining his position as one of the city’s leading artistic lights. This first career brought Domenico fame, money and prestige—and it often left him invisible as an artist in his own right. He worked on the most celebrated decorative projects of his day including the magnificent frescos in the Residence in Würzburg. Yet, with rare exceptions, like the charming paintings in the guest house of the Villa Valmarana, only an expert can tell which parts of these works were painted by Domenico. His contribution disappears into the Tiepolo studio style, and that’s exactly the way it was supposed to be. It’s not clear exactly when Domenico moved into the second part of his career. There is no signal event, no breakthrough work to mark its beginning. More likely it was a gradual process, spurred on by changes going on around him: Venice was in economic and political decline. Artistic tastes were changing, shifting away from the Tiepolo grand style and towards a new classicism. Commissions (reading between the lines) must have dried up. Around 1790, Domenico moved out of the city and took up residence in his villa on the mainland, Zianigo. It’s here we see the flowering of his second, surprising career. On Zianigo’s walls he painted a series of frescoes purely for his own pleasure. These are funky, idiosyncratic pictures of centaurs, scenes from Venetian street life, and Punchinelli—the tall-hatted, beak-nosed clown figures from Italian theater—at play. 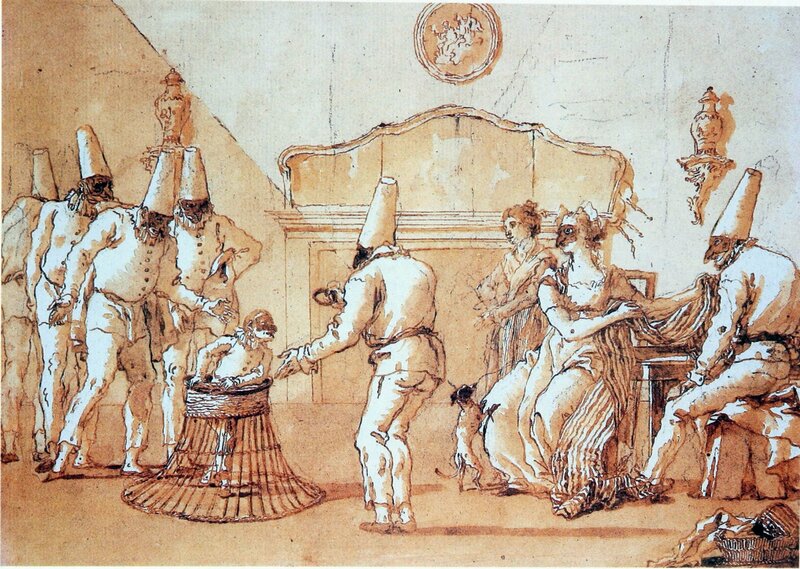 You can see them today in C’a Rezzonico, Venice’s museum of the 18th century. 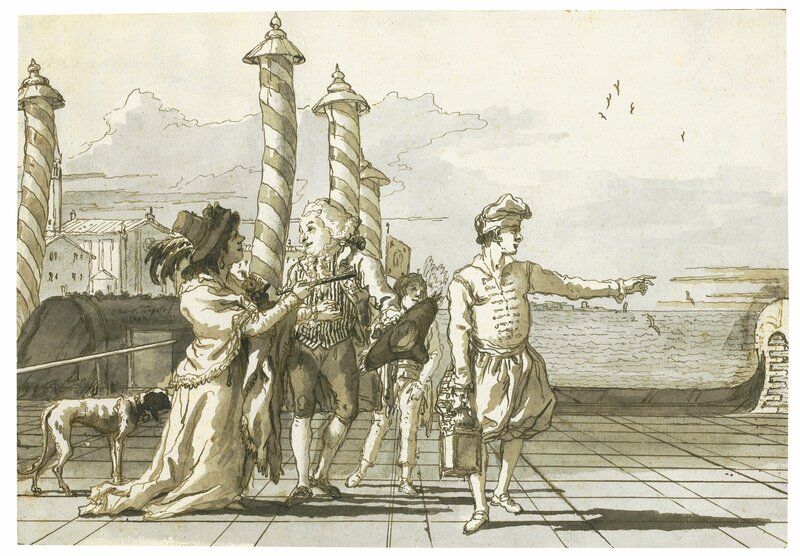 At about this time Domenico Tiepolo also began producing remarkable pen drawings of contemporary scenes and a whole series of comical illustrations of Punchinello’s life story. 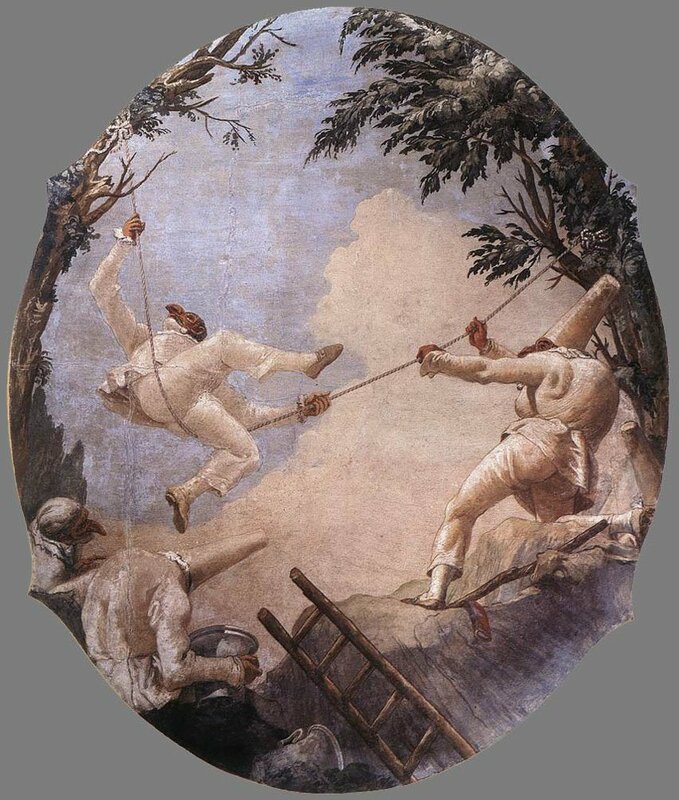 Like the Zianigo frescoes, these sometimes refer to work by Tiepolo, but are at the same time original and distinct. 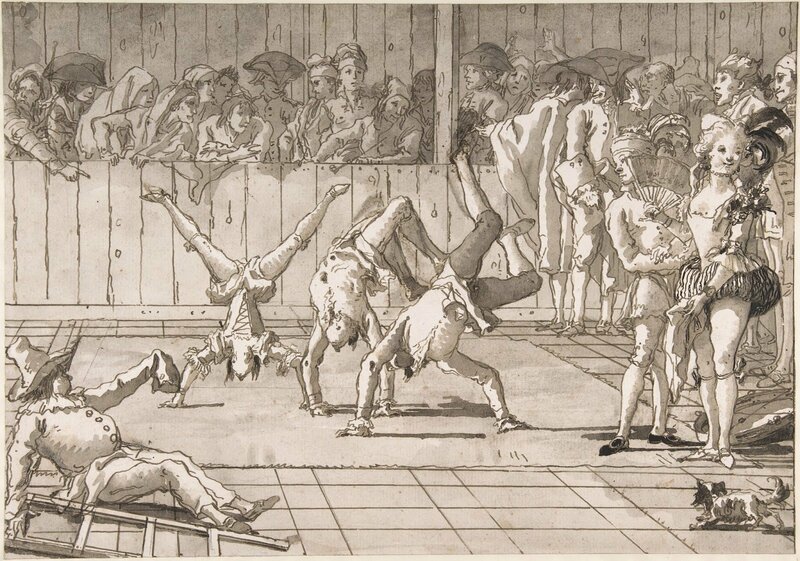 They reveal Domenico’s trenchant wit, his skill at social observation and satire and his flair for theatricality. 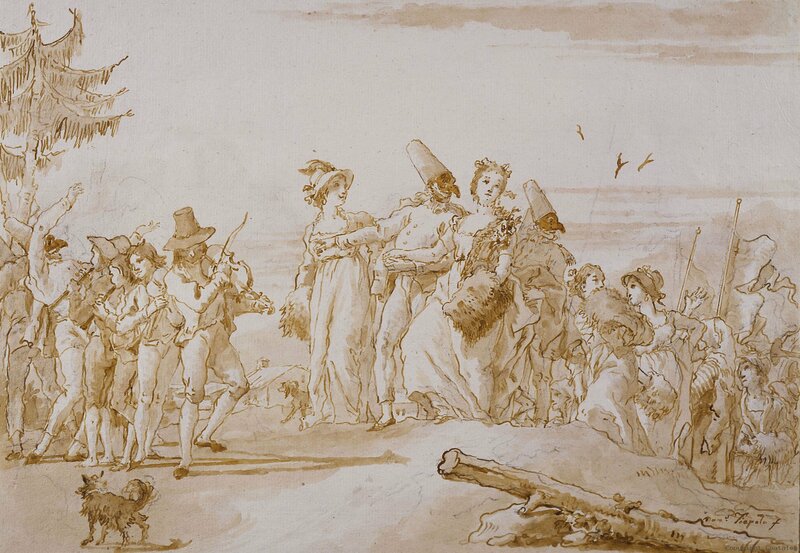 More than any other works, these late drawings—“amusements for children” as the artist called them—are largely responsible for Domenico Tiepolo’s lasting reputation. Domenico lived to see the fall of the Venetian Republic in 1797. He married late in life and no children survived him. During my research I failed to uncover any personal anecdotes about him, let alone juicy gossip like that scandalous story about his mother. It’s difficult to find likenesses of Domenico, apart from the famous double portrait with this father in Würzburg. His life, it seems, was devoted to work and in work he flourished, through not just one career, but two.